Soup. Ahhh, warming, comforting, nourishing, left-over using … Soup. Not a week goes by that I don’t factor in soup as a meal. No, I’m not talking about that can of soup in the cabinet. It’s a great staple to have on hand, but it’s not by any means what I consider soup. Homemade, from scratch with the freshest ingredients, now that’s soup. Soup is what transforms the simplest and plainest ingredients into something grand. Yes, soup excites the natural urges within to cook a meal that rejuvenates the soul. When I’m planning for the week ahead, I don’t think so much about the chicken dinner on my list. Nor do I fancy the crudités presentation of broccoli from the garden. They’ll both be good, but my focus is really on the delicious soups that I’ll make on the following day. It can be quite a satisfying day when you’ve made soup from scratch with ingredients on hand. Just think, you can use up your left-overs (that would have soon been headed for the garbage otherwise), you can stretch your meal into two (saving money is always nice), and you can take the ho-hum out of simple ingredients. With a little planning and knowledge, any cook can realize the same satisfaction derived from soup. 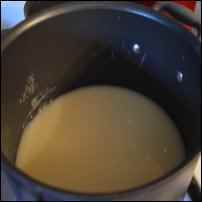 Soups can be made either with a clear broth base or a thicker cream base. In this article, I am sharing my best recipes for both. Though once basic soup-making steps are mastered, the possibilities are endless. For myself, I prefer a cream based soup. 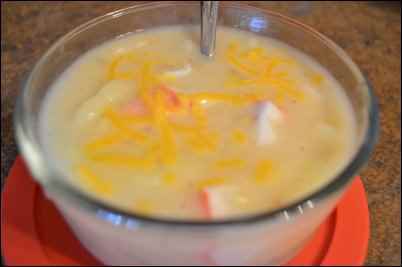 Here in our house we are partial to Crab and Corn Chowder, and Cream of Potato. The two most important aspects about any soup is the broth and/or the roux. The broth or liquid part of the soup provides the base flavor. The roux is what thickens the broth for cream based soups. Let’s start with the broth. Broth can be made from chicken or beef bones, or even left over veggies. This is one reason why I feel soup is a great “left-over” meal. The day after you’ve cooked a whole chicken – it’s soup time. Ideally, you want to you want to strip down the bones of any loose meat. I have found that leaving the meat on only contributes to the amount of fat in the broth and makes it greasy looking and tasting. So only bones make it into the pot. You’ll want to use a large stock pot. One chicken carcass can easily help create one to one and a half gallons of broth. With the bones in the pot, I add at least one gallon of water. Depending on the flavors you want, you can also add vegetables such as onions, celery, and carrots. I don’t usually add these since they are likely to be added to the soup itself. I let the pot simmer for at least six hours. This can also be done in the crock pot. If in the crock-pot, I’ll let it go as long as twelve hours or over night. I heard of people who will let it go even longer. The whole purpose is to derive as much flavor from the bones as possible. The extended cooking time causes the bones to break down and release flavor. The result is a deeper, richer flavor. After you’ve simmered the bones to your liking, let the liquid cool to a decent handling temperature. It should be at room temperature if you are planning to freeze or refrigerate it. I strain the broth using a colander lined with cheese cloth and, of course, another large pot under the colander to catch the liquid. I then dispose of the bones and cheese cloth and portion out the broth. Quart size freezer bags work really well for this. Most of my recipes call for four cups of broth, but you can portion accordingly to your needs. One tip though: I like to stand the quart size bags up in a large cereal bowl to initially put them in the freezer. It makes filling the bags much easier because they stand on their own and if there is any leakage, it is caught by the bowl. 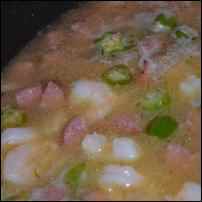 One of our favorite soups made from chicken broth is Sausage and Shrimp Gumbo. It’s flavorful and savory with lots of hearty substance. It keeps well as a left-over and makes a nice addition to a sandwich lunch. It’s also filling enough to be the main course at dinner when served with rolls and salad. Place butter in a large broth pot or Dutch oven. Melt butter over a medium flame. 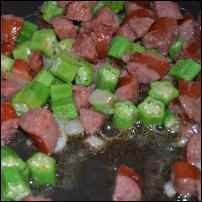 Sauté onions, sausage, and okra until sausage is nicely browned. Remove sausage mixture from pan. Set aside. 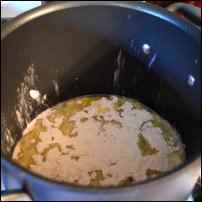 Pour chicken broth and water into pot. Add salt, pepper, garlic powder, and jalapeño. Bring up to a boil. 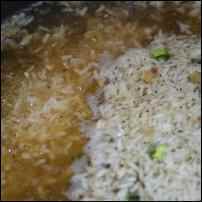 Add in rice. Cover and simmer for five minutes. 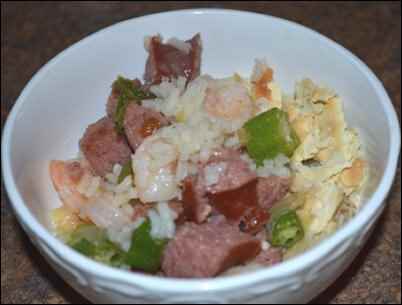 Add back in sausage mixture and add in shrimp. Cook uncovered for five additional minutes. Serve with crackers or crusty bread. For all of my cream soups, I start in the same way – with a roux. 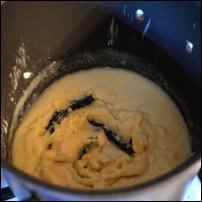 A roux is simply a mixture of fat and flour. It will be the thickening agent for the broth. My preference for the fat is melted butter. Other oils would do, but it’s hard to beat the delicious undertones of butter. You want an equal ratio of both butter and flour. I start with a stick of butter. 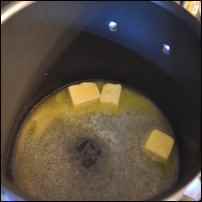 Place the butter in a stock pot or Dutch oven on the stove over low heat. Keep it low or you risk burning the butter. You can add a splash of olive oil which enables the butter to cook at a some what higher heat without danger of burning. I just keep it low. Once melted, sprinkle in a half cup of flour. Be sure to sprinkle it all over the bottom of the pot and not in one big clump. The idea is for the flour to absorb the melted butter and come together as a paste. I find that if I let it simmer a minute or two before stirring, I don’t get clumps. When I begin to stir, I slowly add chicken broth while stirring. It will thicken and then thin out as more liquid is added. In total, I usually add four to six cups of liquid. Obviously, if you like your soup thicker, stick to less liquid. You can always add more later to thin it out. However, it’s difficult to thicken past this point without getting clumps or a floury taste. Let’s say you want to make Crab and Corn Chowder. After the roux has been created, I begin adding the substance. In all of my soups goes chopped onion and garlic. I don’t worry about sautéing. To me, it interferes with the roux coming together. 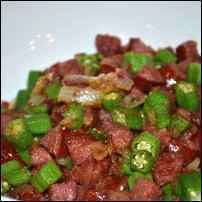 I also add a teaspoon of crushed red pepper for a little heat and salt and pepper to taste. Next, I add the ingredient that takes the longest to cook: potatoes. Cooking the diced potatoes at a low boil for twenty minutes usually does the trick. Note: simmering with the lid off will result in a thicker soup due to evaporation which is a good way to get rid of excess liquid if you over-poured. When the potatoes are done, I add imitation crab (of course you could use fresh) and a can of creamed corn and then simmer for five more minutes. That’s it. Ready to serve. Create a roux with the butter and flour. Slowly stir in chicken broth. Add onion, garlic, salt, and pepper. Add crushed red pepper and potatoes. Cook for twenty minutes on a low boil. Check for doneness of potatoes. Add cream and cheddar. Stir. Simmer for five minutes. Serve. Create a roux with the butter and flour. Slowly stir in chicken broth. Add onion, garlic, salt, and pepper. Add crushed red pepper and potatoes. Cook for twenty minutes on a low boil. Check for doneness of potatoes. Stir in creamed corn and chopped crab. Add cream and cheddar. Stir. Simmer for five minutes. Serve. Both of these recipes are basic and require few ingredients. They can be tweaked to your liking. Of course additional ingredients could be added or substituted. For example, substitute broccoli for the potatoes and you’ve got Cream of Broccoli soup. Cauliflower would work well also. Crisp bacon and a sprinkle of cheese on top are always a nice addition too. 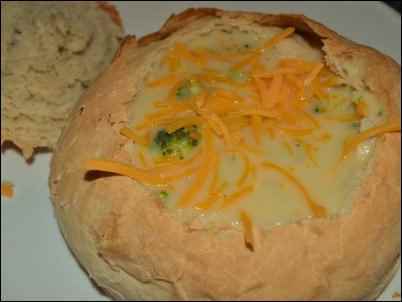 If you want to take it up a notch even still, cream soups are excellent to serve in bread bowls. Quite fancy, but so simple to make. You can easily make a bread bowl by buying refrigerated dough, portioning it out into halves or fourths (depending on the size needed and purchased), forming the portions into balls of dough, allowing it time to rise, and following cooking directions according to the package. So, let’s see, thus far we’ve got three wonderful soups to warm you up on the soon-to-be-coming cool nights. Now, what if it is something heartier, spicier that you seek. Then I can only leave you with an excellent, yet simple, recipe for Chili. It has a wonderful sweetness to it with warming undertones of heat and spice. The ingredients are simple and easy to keep on hand. To top it off, it comes together in under thirty minutes. In a large stock pot or Dutch oven, sauté the onion and pepper until soft. Add ground beef and cook over medium heat until browned. Use a spatula to break up ground beef into smaller pieces. Add two cans of chili beans, 1/2 cup of ketchup, 3 T of brown sugar, and seasonings. Simmer for twenty minutes. Thin with small amounts of water as desired. And there you have it, four great recipes to help you use up those leftovers, create a frugal meal plan, and stay warm on a cool night. Plus, with the basics of making a good broth and thickening roux mastered, you’ll be whipping up great soups in no time. You may even want to experiment with different vegetables and meats and come up with your own great creations. That’s the beauty of having homemade soup on the menu—it becomes exactly what you wanted.